The Golden Gate Bridge celebrated 75 years on May 27th. A bridge that was said can never be built because of various circumstances started construction in the early 1930s and opened on May 27, 1937. The bridge is seen as one of the “Wonders of the World” and is painted with a coat of International Orange paint to help preserve the steel cables and structure from corrosion. The festival for the bridge was similar to that of a street festival, but held at Marina Green and Crissy Field. Unlike the 50th Anniversary where people were allowed to walk on the bridge, the 75th Anniversary prohibited vehicle lane closures on the bridge for pedestrian use. It was reported that the bridge actually dropped 6ft due to the excess weight. For the bridge to keep its structural integrity it was said that bridge walks of that size and magnitude will no longer occur. Instead the alternative was to hold a festival in the bridge’s honor instead. This year the festival was full of music, food, bridge history and education, corporate vendors, an amazing fireworks show, and much more. One of the most educational and touching displays that had the most impact on me was one that displayed shoes and chalk outlined shoe prints. The display was to encourage awareness of “jumpers” and to petition for putting up a net under the bridge to prevent jumpers from jumping and to catch them as a safety net. Volunteers and some family members of victims for this educational display wore black T-shirts that displayed the number 1558. That number is the number of victims that came to the bridge as to find a way out of life. Of the 1558 jumping victims, a little over 30 survived the fall. Each pair of shoes represented a jumper. Of the pairs of shoes, some were actual pairs of shoes given to display as a remembrance by the victim’s loved ones and the other remaining shoes were just purely symbolic. The chalk outlined foot prints represented those that jumped and their remains were never recovered. The representation of the “1558″ display reminded me of a 2006 documentary that was filmed and written by Eric Steel entitled “The Bridge”. Where he interviews family and friends of the victims and even captures footage of such a tragedy. The bridge has been seen to be a magnet for people to come, but I would never recommend to take the easy way out. There’s always help and someone that can help with your pain. All I can say is, “Don’t do it. There’s so much to live for, even though things may not be clear for you in your exact moment of trouble or suffering.” Help is always just around the corner, you just have to look. On a much happier note, two main stages, one at Marina Green and the other at Crissy Field, booked musical artists that entertained guests from 11am to 9:30pm, with a break for fireworks and the Mickey Hart Band to finish off the festival at 10pm at the Crissy Field Stage. Food vendors were located throughout the festival. Lines were extremely long for hot food items; therefore, patience is a virtue. The fireworks show was one of the best shows that I’ve ever witnessed in my lifetime. One thing, however, that I disliked about the show was that integrity of the show was not concentrated in one location on the water. I, along with other media, assumed that the show would be contained at the bridge and under the bridge. Little did we know was that the show would spread out along the waterfront. What a horrible decision to do that because it makes it much more difficult to capture the show on camera and video camera because no one ever wants to reposition a camera back and forth and adjust camera settings throughout the show. Although constantly changing camera position/direction and settings bothered me greatly, I’ve seen some amazing video and photos of others on the internet, but even they had the opportunity to only capture a small number of money shots. I, particularly, had a hard time because the one thing that I feared most to happen had happened. My camera battery died right at the beginning of the show and I had to put in a replacement. The next thing that I found to be extremely difficult was to juggle between two cameras to do videography and photography at the same time. This is a no-no. Never do this. I was so excited for this fireworks show that I wanted to capture every single moment by myself. It’s just way too complicated to do two things at the same time. Lesson learned. Overall the fireworks and light show was phenominal. The weather sure cooperated as there was no heavy fog and it was windy enough to blow the smoke away. This show allowed for me to experience for the first time the bridge lights turned completely off, with the exception of the red aerial lights atop the towers and cables sections. Several other features of the show seemed to amaze me, like seeing a downward stream of falling fireworks that created a wall of fire underneath the center span of the bridge to the water. The colored spot lights moving all around on the bridge and on a couple of boats added more drama to the show. Lastly, the traditional fireworks display was spectacular with so much color and various variety of shapes. I love pyrotechnics. Many congratulations to the Golden Gate Bridge as it celebrated it’s 75th Anniversary. If you thought that this festival was amazing, I wonder how much more grand the 100th anniversary will be. Hope to see you all there in 25 years. 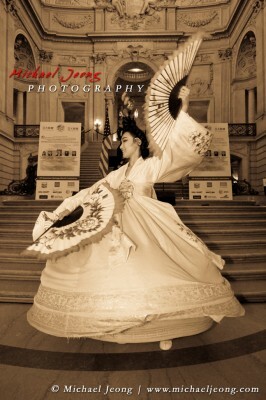 The First Annual Statewide API American Heritage Month Celebration took place Thursday night under the rotunda at San Francisco’s City Hall. 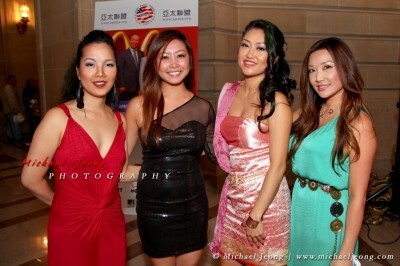 This event was produced by Steven Lee, the first Asian American nightclub owner appointed to San Francisco’s Entertainment Commission. 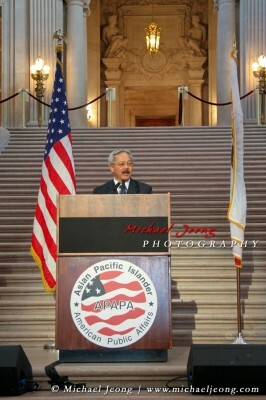 The event was hosted by SF Mayor Ed Lee in which the event honored the Asian Pacific Islander American community. 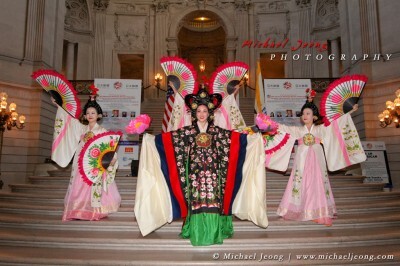 Entertainment opening for the evening included a Polynesian music and dance performance by Halau Makana, a Korean Fan Dance performance by OngDance Company, a Vietnamese song and dance by Dao Tran and Danny Nguyen Dance Company. 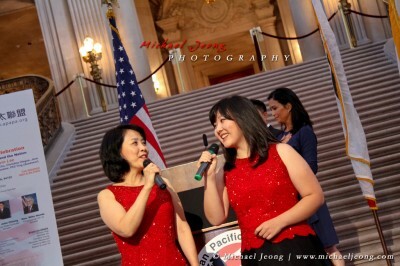 The main program started with the National Anthem sung by a mother and daughter team, Melody Wang & Remona Ji. 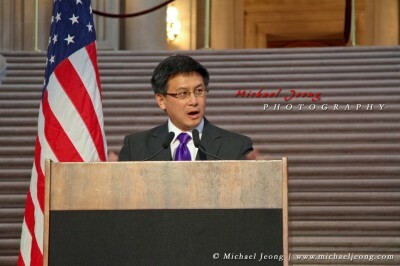 The event was emceed by Frances Dinglasan of ABC7 and Doug Lee formally of KSOL & KBLX. 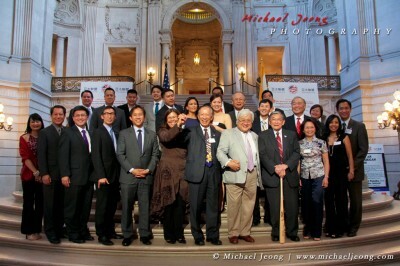 Special guest speakers included: Mayor Ed Lee, CA State Controller John Chiang, Congressman CA 15 Mike Honda, and APAPA Lifetime Achievement Award Recipient and Former Secretary of Transportation Norm Mineta. 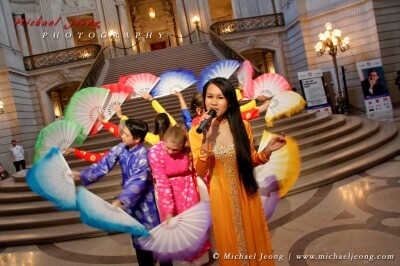 Following the evening’s speakers, the program included musical performances by individuals that represented several Asian heritages. 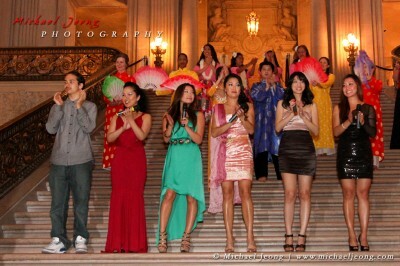 Billy Shen (Mandarin Americans), Lisa Wang (Taiwanese Americans), Sachiko Morino (Japanese Americans), Vivian Lee (Cantonese Americans), Maria Park (Korean Americans), Troy Reinhard (APA Youths), Boom WanvisaWattanadumrong (Thai Americans), and Margie Lao Williams (Filipino Americans). Musical accompaniment was provided by the band “Pulse”. 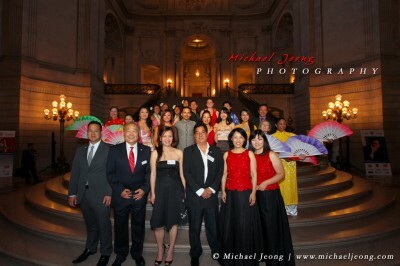 Guests were treated to complimentary food and beverage by Moonstar Buffet Restaurant. On Tuesday, Urban Fauna Studio held their holiday party at The Old Jerusalem Cafe on Irving Street in San Francisco. A good turnout showed up to take part in several arts & crafts holiday activities. The warm atmosphere of the cafe cultivated a nice homey feel that promoted a tranquil environment to meet, greet, and create. Guests brought different types of snacks and desserts for others to enjoy. The cafe provided complimentary coffee and tea. Urban Fauna Studio brought some alcoholic beverages and champagne to celebrate the event. The cafe also had available additional foods and drinks for sale during the duration of the night. Throughout the cafe there were 4 sections to find yourself captivated. Activities that were at the party were marbling, creating holiday gift tags, felting, and designing gift wrapping paper. Some guests even brought their own knitting stuff. At the end of the night almost every person I saw left the party with a smile. As people went home they not only left with some sort of art, but they left with a sense of satisfaction and enjoyment. If interested in arts & crafts please contact Urban Fauna Studio. They will be able to help plug you in with the whole fabrics arts scene. 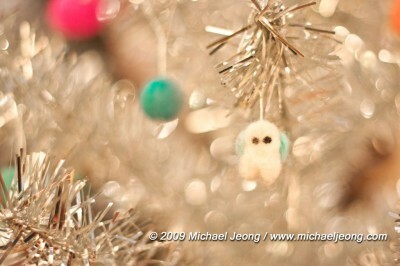 Pictures of the holiday party can be seen by clicking on the picture link above. If this post was informative and helpful, please feel free to leave me a comment or donation below. Thank you. If you don’t know by now, it is now Dungeness Crab season. The California Department of Fish and Game announced back on November 7, 2009 that it is open season for Dungeness Crab out in the Pacific Ocean. The holidays are fast approaching and it’s time to get that crab out onto the dinner table. 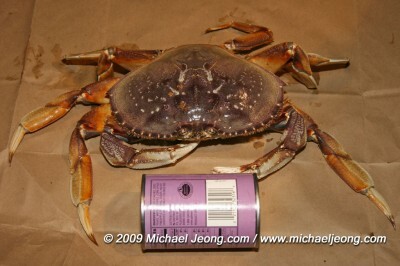 The season for Dungeness Crab will last until June 30th, 2010. For the most part, I’m happy that this season has approached because time after time I’ve always wanted to purchase crab and make new dishes from them. There is this one place down in San Francisco’s Chinatown called R&G Lounge and they have probably one of the best Salt and Pepper Dungeness Crabs I’ve ever laid my taste buds on. I’m in the pursuit of trying to figure out how they do it. If anyone does find out a decent recipe I sure would love to get some feedback from you. So the other day I went down to Chinatown to look for a fish monger that would be still open because I arrived in Chinatown at about 6:20pm. Most stores in Chinatown close at about 6pm, but I happen to find a shop that was still open. As I walked in I saw all sorts of fresh fish, shellfish, and crustaceans. However, my eyes were set on one thing and one thing only, crab. 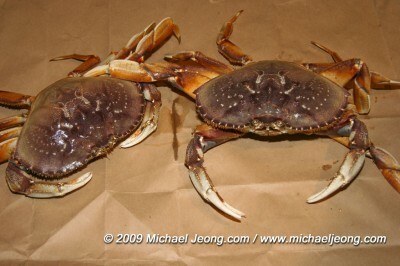 I walked over to one of the workers there and asked him to help pick out two large Dungeness Crabs for me. First thing he did was grab a plastic bag that was lined with a paper bag inside of it. Next, he shifted some of the foam away from the top of the water tank as he stuck his bare hands into the water. In my mind, I was shocked to see him brave enough to stick his hands in there and not use a stick or some sort of net, this guy has “balls”. So with his gutsy move, he picked out two crabs that were to my liking and I was happy and went home with two 2.5lb crabs at $3.99/lb. My head calculations bring that to about $20 for two crabs, what a bargain. That’s like going to a restaurant and getting a crab for free, if only it were that cheap to get one alone at $20. 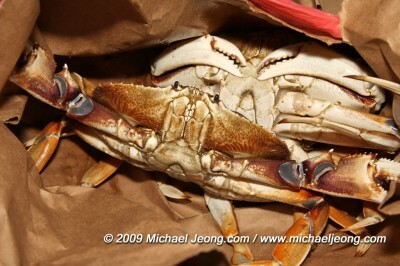 Most restaurants around the city charge anywhere from $35-50 for a single crab weighing about 2.5lbs. 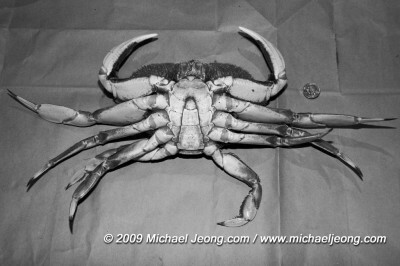 When I got the crabs home I took a few pictures to scale the size of these monsters. I happened to use a quarter to show scale, but I should have known that the quarter was too small and that I should have used a dollar bill. Anyhow, the next universal thing that I did was found a can of fruit cocktail and I placed it in front of the crab to show a little bit of the scale of the crab and I think that did justice. The next day I decided to cook the crab in the oven. I took the crab and cleaned it. After cleaning the crab I broke the crab into segments. On the stove top I cooked up some minced garlic with butter and salt and fresh ground pepper to season the crab. I tossed the crab into the mixture coating the shells and then placed the crab segments into the oven and spooned the remaining garlic butter mixture on top of the crab as it roasted. 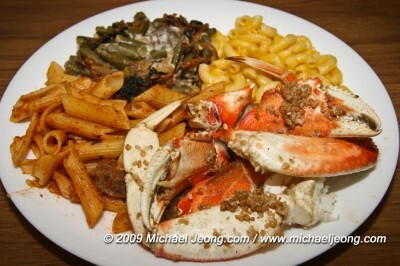 After the crab finished roasting, I placed the crab with some pasta, green bean casserole, and macaroni and cheese. The meal was delicious. Now the leftovers will probably be used into making some sort of crab cakes if it lasts that long. Anyhow, I’m still looking for a recipe for deep fried salt and pepper crab and if you have a recipe that’s delicious please share it with me. If this post was informative and helpful, please feel free to leave me a comment or donation below. Thank you. On the November 22nd, the Miss California USA 2010 took place at the Agua Caliente Resort & Spa in Rancho Mirage, CA about 30 mins from Palms Springs, CA. Contestants for the pageant stayed at the Riviera Resort & Spa in Palm Springs, CA where they conducted orientation, interviews, and rehearsals. There were 133 contestants from all over California who participated in one of the largest gatherings in the Miss California USA Pageant history. 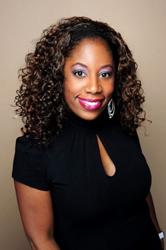 Hosting the Pageant was Chris Jacobs who is an entertainment correspondent and weekend anchor for The Insider. Celebrity Judges for the event included: AJ Buckley (CSI, Bones), Claudia Jordan (Celebrity Apprentice), Dr. Frank Ryan (Beverly Hills Plastic Surgeon to the Stars), Kelly Monaco (DWTS, General Hospital), Hill Harper (CSI, The Handler), Randall Slavin (Celebrity Photographer), Shandi Finnessey (DWTS, Celebrity Apprentice), Tony Bowls (Fashion Designer), Lu Parker (Emmy Award Winning Journalist), Francine Champagne (Owner Vision Models), Tiffany Fallon (Miss Georgia USA 2001), and David Fendrick (COO of Agua Caliente Band of Cahuilla Indians). 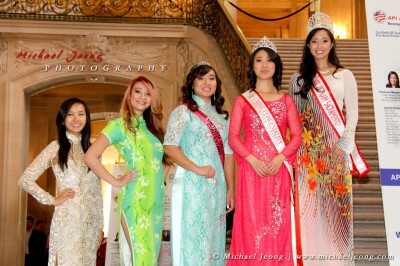 Congratulations to all the women who competed in the pageant you all were great. 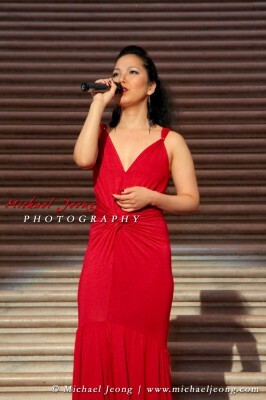 To my good friend Louise you did an exceptional job on stage. You were very poised and presented yourself like no other. Keep on shining. 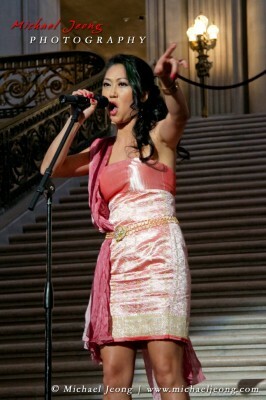 Louise Wu, is currently an assistant on the Ellen Degeneres Show and during the weeks prior to the pageant, Louise was pampered left and right with help from Ellen herself. On different episodes of Ellen, Louise was given some helpful and some not so helpful tips. These are a few of the things that Ellen provided for Louise on her show: Ellen helped give tips on make-up, Ellen provided an evening gown for Louise, Fran Drescher assisted Louise on skin care, Ellen conducted a quiz show for Louise against Miss California 2009 (Tami Farrel), Ellen provided Louise with a great send off, and following the pageant when Louise did not receive the Miss California crown, Ellen provided Louise with a tiara. YES WU CAN! For Veterans Day, in honor of U.S. military soldiers either active, retired or who passed in battle or other lines of duty I want to thank all of you for your honorable service to this country. Without your contribution to backing our government we would have not been able to be where we are today. Continue to fight for our country and know that you are and will be remembered. Thank you so much. I know it won’t mean probably too much to my normal readers, but to my veteran and active duty soldiers, I met four soldiers having a picnic together right next to the Battle of the Bulge monument near the Jefferson Barracks Cemetery in St. Louis and they seemed to be having a wonderful time together talking about the past and present. These four men never fought side by side with each other, but what they did share in common was being able to survive and be apart of an amazing victory for the Allied troops during the Battle of the Bulge of World War II. As I was asking a few questions, one of the veterans mentioned to me that the winter of 1944-45 was probably one of the coldest he’s ever experienced and that the frigid weather made it really hard on his body and to fight. For their valiant and courage I give them praise. They were out numbered by the Germans, but they were able to overcome the, I believe he said, 6 German to 1 Allied soldier. 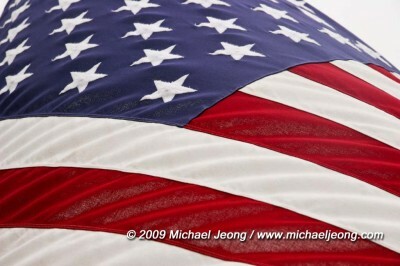 I wrote about Memorial Day several months ago and I would like to share with you readers some pictures I took while with a friend in memoriam of those that have fallen for our country whether in battle or while back in our homeland. 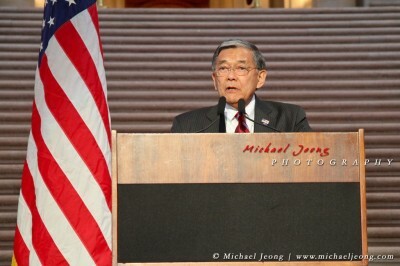 Pictures of my Memorial Day tribute can be seen by clicking on the picture link above. Please feel free to leave me a comment or donation below for the pictures and/or the posting. Fleet Week 2009 started off Saturday morning with a Parade of Ships. The ships entered under the Golden Gate Bridge at about 11:30am. Leading off the fleet was the USS Green Bay, followed by USCGC Boutwell, then from Canada the HMCS 710 Brandon, HMCS 705 Whitehorse, HMCS 703 Edmonton, and finally followed by SS Jeremiah O’Brien. This year I was able to board two ships. The two ships that I toured were the USS Green Bay and USCGC Boutwell. The USS Green Bay is a amphibious transport dock ship. The main purpose for this ship is to provide transport of troops and vehicles to sea or land. The ship is capable of landing helicopters and harrier jets. It also can deploy small boats, tanks, armored vehicles, construction vehicles, and even hovercrafts. The home port for the USS Green Bay is in San Diego, CA. The other ship that I was able to tour was the USCGC Boutwell. 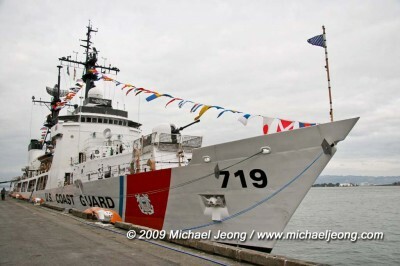 The USCGC Boutwell is a Coast Guard Cutter ship that is used to patrol the shores of the United States. The main purpose of this ship is to protect and patrol our shores from enemies foreign and domestic. On board the deck of the ship are two 50 caliber machine guns one on each side of the ship, two 25 caliber machine guns on each side of the ship, one MK-75 76mm machine gun on the bow, and a Phalanx CIWS (Close-in weapon system) at the stern which is an anti-anti-ship missile machine gun that can shoot a wall of lead at possible incoming missiles. The home port for the USCGC Boutwell is Alameda, CA. Touring both ships took almost three hours total and I did not get a chance to board the Canadian ships. I was a little bit disappointed in not seeing them because Monday was their last day docked here in SF and were headed back home to Canada. Tuesday turned out to be a rainy day and so I doubt if any ships allowed any civilians to board ship. Funny thing as I left the USCGC Boutwell two female shipmates wanted to take a picture of me and I humorously agreed to take it with them. Pictures of the Fleet Week Naval Ship Tours can be seen by clicking on the picture link above. Please feel free to leave me a comment below for the pictures and/or the posting. Hasbro’s Candy Land, an iconic game almost every American has played at least once while growing up celebrates 60 years. 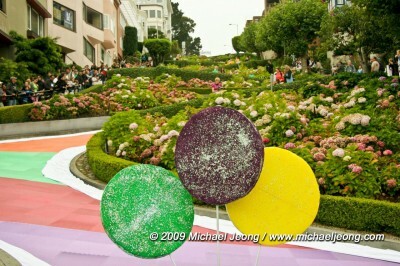 For this anniversary celebration Hasbro had turned Lombard Street, which is San Francisco’s iconic landmark known to be “The World’s Crookedest Street”, into a giant Candy Land gameboard. Children from the UCSF Children’s Hospital were invited to attend and play a game on this real life sized game. Even the colored game pieces were large, just imagine trying to shuffle the deck before the game. The children were divided up into four teams. Team colors were red, blue, green and yellow. As the cards were drawn the teams travelled down the hill any means possible. Some children ran down the hill, some skipped, some walked, and even some slid down the hill on their stomachs. Along the gameboard were three Candy Land characters. King Kandy, Princess Lolly and Princess Frostine. They stood in their respective positions (Princess Frostine at Snowflake Lake, Princess Lolly in the Lollipop Woods, and King Kandy up the road from Candy Castle) on the gameboard until the children had passed their spots on the board. After all the children passed these locations each of three characters accompanied one of the teams. The team to finally reach the winning square was the yellow team. The team was congratulated with a hailstorm of confetti and lots of jumping up and down. Following the game, the four teams gathered around the Candy Land decorated birthday cake and celebrated Candy Land’s birthday by singing “Happy Birthday”. The cake was vanilla flavored with a chocolate filling and covered in a fondant. Children took home a game of Candy Land and a bag filled with their selection of candies. 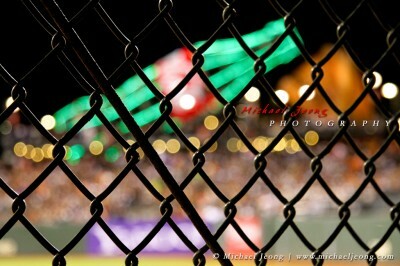 Pictures are added to the gallery click picture link above. Michael Jackson’s public memorial at the Staples Center in Los Angeles, CA was an emotional celebration of the life that he lived. He was honored for being a man of great accomplishment and a kind humanitarian. The “King of Pop” was seen by about 20,000 guests (family and fans) while the rest of the world watched on television and over the Internet. Fans were able to attend the ceremonies by obtaining tickets via winning a lottery. Fans logged onto the Internet and entered a random lottery where winners were notified by e-mail. They were then asked to bring their confirmation email down to Dodger Stadium where they would show ticket handlers and they would then receive two tickets and two wristbands. The heartfelt and emotional memorial was a great demonstration of the amount of love that people had for this man. Despite the negative reviews about his personal life, Michael Jackson lived most of his life helping others and that’s what the focus of this memorial was all about. I watched the memorial on television at home as I wished that I could be there, but watching it at home allowed me to cry without anyone watching. However, since I’m telling you now about it, it was a manly cry. Pastor Lucious Smith – he opened the memorial service by telling viewers that around the world Michael was seen as an idol, hero, and even a king. Smith also stated that Michael through his words, music, and good deeds tried to heal our world. His testimony was very warm and comforting. Mariah Carey and Trey Lorenz – both sang a duet to “I’ll Be There”. I remember listening to this song in the early 90s which was originally sung by Michael Jackson (Jackson 5) in 1970. Mariah Carey sang this song with back then background vocals Trey Lorenz. Both sounded good, but not quite as good as Mariah’s album version. Nonetheless, this is probably one of my favorite songs. Queen Latifah – spoke about Michael and her early years when her and her brother bought an album with Dancing Machine and they tried to dance and be like the Jackson 5. She also read a poem written by Maya Angelou. The poem was entitled “We Had Him”. Very touching poem and makes one proud to have known him and to be able to have him within our midst. Maya Angelou attended my high school, George Washington H.S. 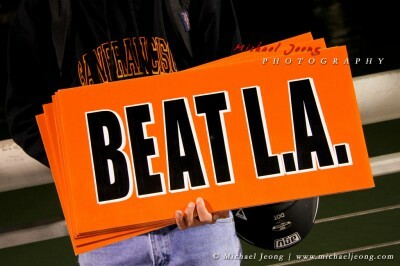 which overlooks the Golden Gate Bridge. Lionel Richie – sang “Jesus is Love” in tribute to Michael. Lionel sang this song while he was with The Commodores. 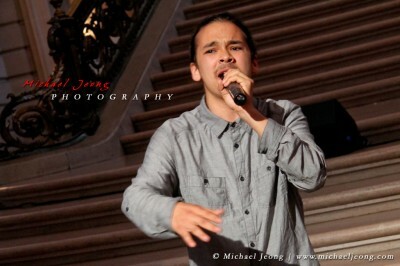 He wrote “We are the World” with Michael. Lionel is another talented singer that I’ve blessed to have listened to while growing up. Stevie Wonder – gave a few brief words before singing “Never Dreamed You’d Leave in Summer”. Stevie Wonder is another amazing artist. Kobe Bryant and Magic Johnson - Bryant shared briefly of Michael and his record breaking talent and he even made the Guinness Book of World Records for most charities supported by a pop star. Johnson shared about his life growing up knowing the Jacksons while he was with the Lakers about 30 years ago. He went on to share about the time when Michael asked him to be a part of the music video “Remember The Time”. Johnson also recalled going over to his house to talk about the video and the chef asked what Johnson would like to eat and he asked for grilled chicken, when dinner was served Johnson got grilled chicken while Jackson got Kentucky Fried Chicken. He jokingly said that he didn’t know that Michael Jackson eats this type of food. Johnson finished up his eulogy stating that Michael opened up the doors for Black people all over the world. Jennifer Hudson – sang “Will You Be There”. This song was featured in Michael’s Dangerous album and for the movie Free Willy. John Mayer – had no words to say but he played electric guitar to an instrumental to Michael Jackson’s song “Human Nature”. Brooke Shields – reminisced about the years of her life when she use to hang out with Michael. Brooke said that both him and herself had to grow up fast and be adults and a young age. However, whenever they were around each other they would be like kids. She told us that she had never danced, collaborated or sang together, but what they both shared together was laughter. She gave examples of moments where they’d laugh together and Michael being his mischievous self. She went on to share that Michael’s favorite song was a song written by Charlie Chaplin for a movie called Modern Times. That song is entitled “Smile”. The song was first recorded by Nat King Cole and later by others including Michael himself. Jermaine Jackson – came on the stage to sing Michael’s favorite song “Smile”. Congresswoman Sheila Jackson Lee – commemorated Jackson by honoring him with House Resolution 600. 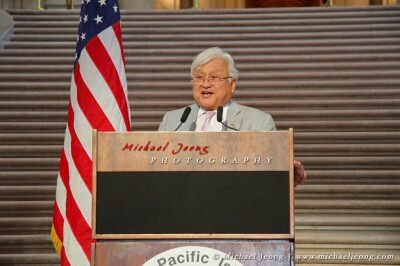 It was to commemorate his humanitarian efforts to help change this world. Following the memorial House Resolution 600 was put on hold by House leader Nancy Pelosi until it receives further legislation that is needed for it to pass. 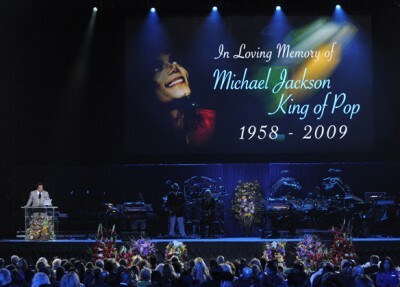 Usher – performed one of Michael’s songs called “Gone Too Soon”. As Usher performed he emotionally broke down, while singing still wonderfully. I too broke down and cried almost twice listening and watching. It is a very touching and emotional song that keeps me choked even now. The lyrics are just very touching and it is so applicable to this situation. It’s a song that I would not like to hear at memorial services for it is very intense. Short video of The Ed Sullivan Show – The Jackson 5 sung a song entitled “Who’s Loving You?” As the song is sung Michael sings with a fluffy pink hat while his brother sing and back up dance. Smokey Robinson – speaks about the song that was just played in the previous segment. Robinson says that he wrote that song. He wrote it and Berry Gordy introduced him to the Jackson 5 who would later sing it. Robinson said that it was a little weird to see Michael Jackson at age 10 sing his song of a situation about what an older person might experience in his life. Robinson told about a funny situation where he would sing “Who’s Loving You?” at concerts and young kids would come up to him and ask him if he’s singing one of Michael Jackson’s song. I laughed after hearing that comment because it’s so funny how we often forget about the song writers, but we don’t forget about who sings a song. Robinson concluded that he was glad that he was born in this era where he could inevitably see the greatest entertainer of all times. Shaheen Jafargholi – from Britain’s Got Talent sang “Who’s Loving You?”. Shaheen following the song went on to say that he loves Michael Jackson and that he thanks him for blessing him and everyone with his amazing music. Kenny Ortega – is a producer, director, and choreographer. He helped create and direct Michael’s latest tour that was going to start in July in London, but of course that did not happen. The name of the tour is ironically titled This Is It. Ortega introduced Shaheen to the world by telling viewers that he was invited by Michael Jackson to join the tour in London and that Ortega thanked Shaheen for coming all the way out to the U.S. for this occasion. Ortega went on to share that it was just about a week ago where he can recall that it was in the Staples Center where Michael and the rest of the cast and crew were there practicing. He thought that what better place to have a memorial service than to have it in Michael’s house. 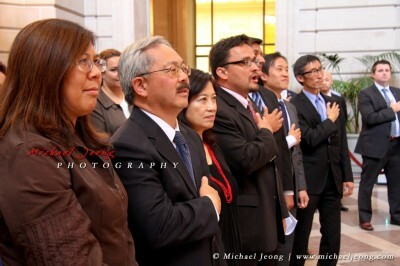 Nevertheless, Ortega helped put together the memorial service. After the short eulogy, Ortega invited out some of the cast from the This Is It concerts in London to come out and sing. 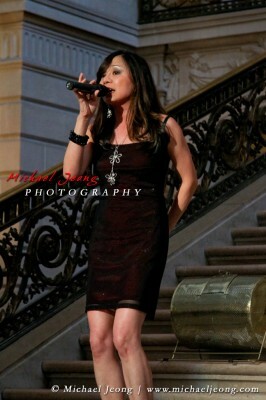 The two songs that they performed were “We are the World” and “Heal the World”. During “Heal the World” close family, friends, guest performers, and some children came together in one unified group and sang to one of Michael’s most favorite part about the tour. Jermaine, Marlon, and Paris Jackson – gave some kind words on behalf of the family. 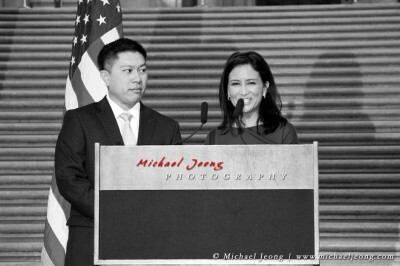 Jermaine thanked everyone for attending and he was lost for words, but he was Michael’s backbone throughout everything. Marlon emotionally shared and wondered why Michael had to be called away so soon. He recalls a moment of their childhood trying to watch the Three Stooges before mom had to tell them that it was time to go to the recording studio. He then went on to reminisce about a time when he caught Michael in a record store dressed up as an old man buying up all the CDs. Michael then questioned Marlon how he knew it was Michael. He answered it was because of his shoes that he was wearing. I almost came to tears when Marlon continued to say, “We will never understand what he endured, not being able to walk across the street without a crowd gathering around him, being judged, ridiculed. How much pain can one take? Maybe now Michael they will leave you alone.” Marlon had one request of Michael and that was to give twin brother Brandon Jackson a hug. Brandon was still born during Marlon’s birth and so he never had a chance in this world. 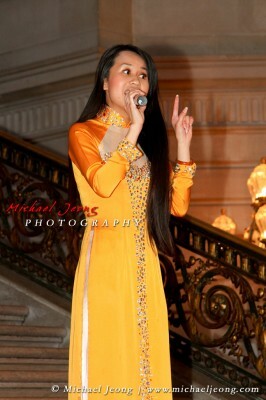 Paris, Michael Jackson’s daughter requested to speak to the audience. She said, “Ever since I was born, Daddy has been the best father you could ever imagine. And I just want to say that I love him so much.” With that said she broke down in tears and Jermaine closed out the memorial service. Spotlight on empty mic stand – spoke thousands of words. 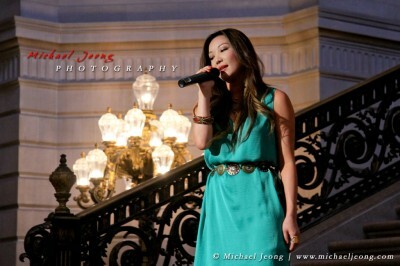 Nothing could describe a mic without a singer. Pastor Lucious Smith – came back onto the stage to close in prayer. Some say that this memorial was a production in itself and that it was cheesy, but I think that it was a great celebration for the life that he lived. With all the achievements and humanitarian efforts that he contributed to this world. I think if anything that this production falls no way near what he deserves. If you ask me the celebration should have lasted hours and hours and with representatives from each nation that he touched. In closing the only thing I can say now is that may Michael Jackson rest in peace. May he not be the center of gossip and discussion. May a little bit of his life and influence be continually living within all of us.